So just a shorty with this one. 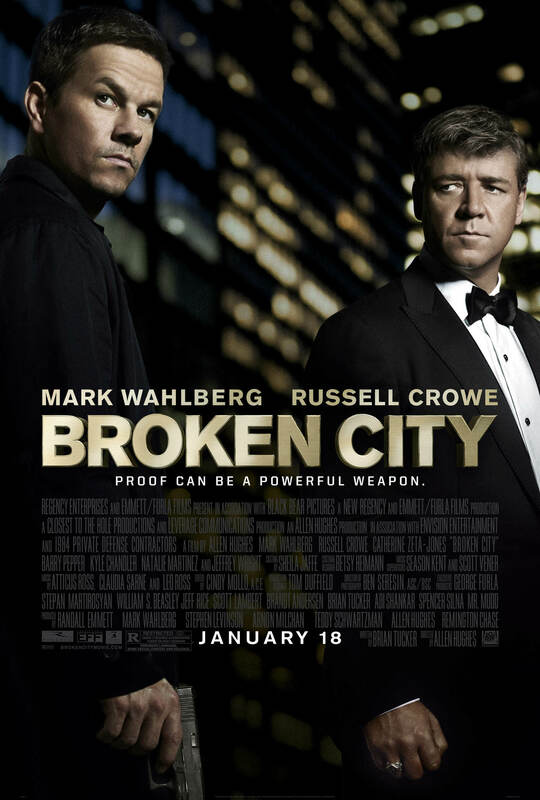 Broken City being one of Mark Wahlberg’s 2013 films, is that it suffers from the same thing a lot of his other movies have, writing problems. The movie’s overall plot is good, but the twists and turns while a bit predictable, are lost in some of the extra characters tossed into the movie. Being a crime drama fan, I have watched my fair share of detective stories and episodes of CSI and NCIS, to know the basic formula. This one does follow a couple of those formulas, but even then, there are some issues with this movie. Granted the role Mark Wahlberg plays, is pretty much the same as most of his serious roles, but at least he fits the bill for the brooding detective, that may not be the most likable hero, is still the hero. One of the characters that kind of feels awkward and doesn’t fit with the rest of the movie is his character’s girlfriend. A lot of the conflicts derived from their relationship, are shoed in and only show up when Wahlberg’s character has a blowout over something she did. Natalie Martinez plays his girlfriend, and while I know she can act, as I’ve seen it on CSI:New York, it’s just her character doesn’t fit with the rest of the movie. The conflict with her character is just thrown in to add to the numerous problems Wahlberg’s character has to go through in order to bring us to the moment where he’s snapped back to reality. Since he has the almost common cliché of the downward spiral of a major character in a crime drama. We don’t know exactly who the villain is within the story, but with the way it develops, you can kind of guess within the first half hour. Russel Crowe is the current Mayor of New York in the movie, where in context of the story, is nearing his re-election and needs Wahlberg to oust someone leaking information to his competition, but disguises it to make it seem like his wife (played by Catherine Zeta-Jones) is having an affair. We can see this politically charged situation is brought further into the plot, when it also involves the Mayor’s direct competition for his job, (Played by Barry Pepper of True Grit, Saving Private Ryan and Battlefield Earth). There are numerous people in the movie, and while I’m not really spoiling anything, it’s just kind of hard to explain what I’m going on about without spoiling the whole thing. Certain characters are just there, and don’t help the plot move much along. Granted you could make the point about his girlfriend, relating to his past with a case he was on that had him removed from the police, but she could’ve been written out to illustrate the point that his relationships failed because of who he is, and it wouldn’t have changed the character at all. Point is with this movie, if you’re a fan of Crime Drama and Big stars like Mark Wahlberg, Russel Crowe and Catherine Zeta-Jones, then you may enjoy this movie. I found the movie had potential but just kind of pushes things along to keep the pace moving to avoid stagnation. I’d say give it a rent, if you’re bored and want to watch something. Other than that, there isn’t much left to say.